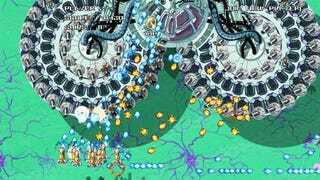 Xbox 360 owners will get a rare opportunity to play a manic top-down shoot 'em up next month with the release of Shoot 1UP, a shmup with all the bullet-hell trimmings mixed with a clever mechanic. The self-described "manic-yet-playable shooter" is from Mommy's Best Games, the developer of indie efforts Weapon of Choice and the forthcoming Grapple Buggy. Shoot 1UP focuses heavily on building an armada of ships—up to 30 at the same time—that can condemn enemy ships to bullet hell too. Shoot 1UP's debut trailer highlights some of the gameplay mechanics, including two-player co-op, the mirroring "ghost" power up and the ability to steal ships from a friend, all coated in a thick layer of brightly colored bullets. Keep an eye on the Xbox Live Indie Games channel in January for the game.